Your airsoft rifle is great, but you know…it can be a bit of a pain. That’s especially true in close quarters battle situations. You can try to hug that corner, but when you peek to fire, you’re going to show a lot more of yourself. Sling that bulky rifle, draw your pistol and you’re ready for those CQB situations. Now you’ve got another decision to make. By the end of this article, you’ll have an answer to the airsofter’s lifelong question: which gun to get? Why Get an Airsoft Pistol? The tactical option to swap to a pistol is invaluable. A good sidearm helps you prevail in close-up firefights. You expose less of your body when you peek to fire with a pistol compared to when using a rifle. If you’re an airsoft sniper, a sidearm will be an essential piece of your kit. Your long-range specialty is great, but you’ll be almost useless if the enemy closes. With a pistol, you’ll be ready to take that fight. If you want to give it a shot, you can even choose to leave your rifle in the staging area. Try playing a game with just your sidearm. Those can be a lot of fun. You have to think about your shots before you take them. Your pistol won’t outshoot a rifle at medium to long range. However, you get a lot of mobility. With your pistol and just a few magazines, you can play like Tom Cruise or James Bond. An airsoft pistol is certainly not an essential piece for a beginner. If you’re just starting out, you’d be better served with an airsoft rifle. With it, you’ll start to learn the basics of airsoft. That said, high-quality pistols are less expensive than high-quality rifles. If you want a relatively inexpensive option to try out airsoft, a pistol may be for you. You’re not going to get the same performance out of your sidearm, but you will be able to check out airsoft without burning your life savings. 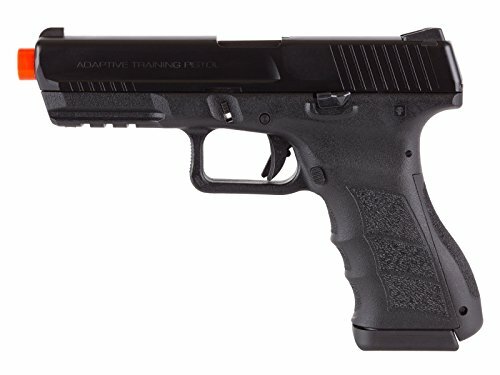 What Are Some Limitations of Airsoft Pistols? Out of the box, your airsoft pistol will not outperform a rifle. It will take a lot of money and time to even make it match a rifle. That’s the thing, though. A pistol is not supposed to outplay a rifle. Both are tools for different tasks. It’s like asking an Allen wrench to tighten a Phillips head screw. It can’t be done, but that’s not the tool’s fault. You want the tool to do something it wasn’t made to do. A pistol has strengths and weaknesses just as a rifle does. Another setback for airsoft pistols is their magazine capacity. A regular magazine typically holds 12 to 15 rounds. Compare that to the capacity of rifles, which can have 450 rounds before you need to reload. You won’t be able to suppress an angle with your pistol because of this. You also sacrifice accuracy and range. With your short barrel, the projectile won’t travel as far. You definitely won’t snipe another player with your sidearm. Anyone in close range should be easy enough to hit. Still, with practice and some hop-up adjustment, you’d be surprised with how far your pistol can reach. Upgrade options for some sidearms can also be limited. The parts in pistols are usually not universal. In general, this means there will be less aftermarket support for your sidearm. That doesn’t mean there are no options. Just that there are fewer options. Compared to electric guns, gas airsoft pistols can be rather finicky. If you don’t know how to take care of one, you may have purchased a cool looking money pit. Basic maintenance goes a long way and it’s easy to learn. Your airsoft retailer will have silicone oil, unjamming rods and inner-barrel swabs. Learn to take the slide off of your gun and lubricate the moving parts and the seals after every outing. Apply the lubricant to your magazines on the fill and percussion valves and the seals, too. Your wallet will thank you for it. Typically, airsoft pistol magazines are more expensive. That’s because they’re more complex than any AEG’s hi- and mid-capacity magazines. Those only have fasteners, springs, and gears inside. Nothing complicated. A gas magazine, though, can have those things as well as valves, rubber seals, and gas chambers. You need to take extra care of those magazines, too. Gas magazines are more delicate than AEG mags. The main thing that you need to decided when you are picking out a pistol is what propolsion type you want on your gun. There are advantages and disadvantages to the three main choices. Why CO² / Gas Pistols? Any airsoft pistol will let you get closer to cover so you present a smaller target, but only CO2 pistols offer more consistent projectile velocities. These pistols use pressurized steel 12-gram cartridges of carbon dioxide gas. Some pistols store the cartridge in the grip of the gun. Some hold it in the magazine. They come in both blowback and non-blowback action. Compared to green gas pistols, CO2 pistols are unaffected by extreme temperatures. You can buy 12g cartridges of CO2 in bulk, saving you money. You’ll find the cartridges these airsoft guns use in any big-box retailer. The typical pistol will fire between two and four full magazines on a new cartridge. Spent CO² cartridges are easier to dispose of responsibly than green gas cans. When you insert a cartridge into a magazine or the grip of your pistol, the gun punctures the cartridge at the top, cycling the gas into the system within the gun. For this reason, you can be sure that the cartridge is completely spent when you remove it from the magazine. Some recyclers won’t accept green gas cans because there’s no way for them to know if the can is empty. This poses a safety and pollutant risk. Check with your local scrap yard or recycler to see if they will accept empty cartridges. One of the drawbacks of CO2 pistols is of a more tactical nature. Because you can’t top-off a CO2 cartridge between rounds like you can with green gas magazines, you run the risk of having an empty CO2 cartridge in your sidearm when you need it most. Changing out the cartridge in the middle of a firefight will almost certainly earn you a trip back to respawn. To avoid this problem, try to keep track of how many times you’ve emptied a specific magazine. You’ll know roughly when you need to change the cartridge. If you happen to load an empty magazine into your pistol, simply pop the mag out and insert a new one. If that one’s empty, well….there’s always time to change out the 12g cartridge between spawns. If the CO2 pistol holds the cartridge in its grip, it will be even easier to keep track of when you need to replace it. CO2 pistols tend to shoot rather hot. Some have a muzzle velocity of 400 feet per second. We’ve even heard of one firing at 600 FPS! Typically, the box of an airsoft pistol will show the velocity of the projectile as it leaves the barrel. The box will also display the mass of the BB the factory used to test its FPS. To make their airsoft gun seem more impressive on the shelf, manufacturers will test with .12 gram BBs. This leads to a higher FPS. Since no one ever takes to the field with .12s, you’ll see a lower FPS when it comes time to chronograph your CO2 pistol. Unfortunately, most indoor fields will restrict the use of any airsoft gun that measures higher than 400 FPS at Chrono. Most outdoor fields will let something that hot play, though they may restrict at what range you are allowed to engage a target. If you think there might be an equipment restriction at your local field, feel free to ask the owner or an administrator. Their first job is to run a safe game, and they will work with you to make that happen. Keep in mind what types of fields are available in your area when making a purchasing decision. As you may know, a can of green gas is just propane with a silicone oil additive that helps lubricate the pistol as it is fired. The CO2 gas in a 12g cartridge is untreated, meaning it’s just the gas. Using 12g cartridges alone without proper maintenance will undermine the lifespan of your pistol. You must clean and maintain your CO2 pistol before and after use. But this is the case with any airsoft gun. A responsible airsofter must know when and how to take care of their equipment. Apply silicon oil to the moving parts by hand between games. The most common cause of leaking cartridges is a dry seal. So, when you change cartridges, apply some lubricant to the seal where the CO2 feeds into the gun. When it comes time to decide which CO2 pistol to buy, you need to consider some of the following. 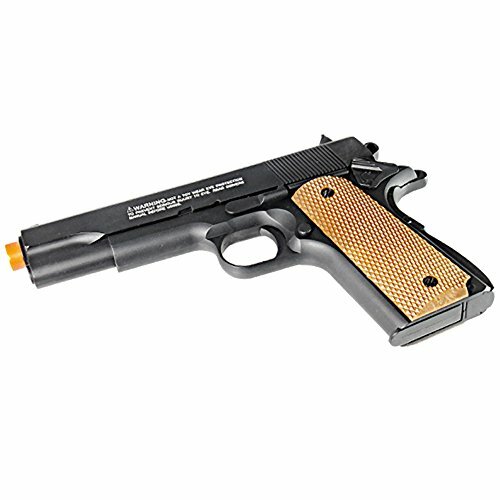 Do you want an airsoft pistol with blowback or non-blowback action? Nothing in airsoft is more satisfying than a strong blowback on a CO2 pistol. However, blowback pistols are typically more expensive than their immobile siblings. The less expensive non-blowback pistols tend to have very few external metal parts. The really inexpensive ones are almost always made of that plastic that feels like a toy. So, if you want something that looks and feels as strong as it shoots, you’ll need to spend the extra cash. Fortunately for you, CO2 pistols come in many configurations. There are revolvers with simulated shell reloading for added realism. With these, you’ll be given shells which you will hand load BBs into. The 12g cartridge will go in the grip. You’ll also find CO2 pistols with selective fire options. You’ll have a choice between safe, semi- and full-auto, just like a full sized rifle! Do you want your pistol to run on green gas or CO2? There aren’t many differences between the two systems. Still, airsofters swear by their gas of choice. CO2 works at higher pressures, which means more FPS, but cause more wear and tear on the internals. If you want your green gas gun to use CO2, you will need to upgrade it. Even then, it’s not the best idea. 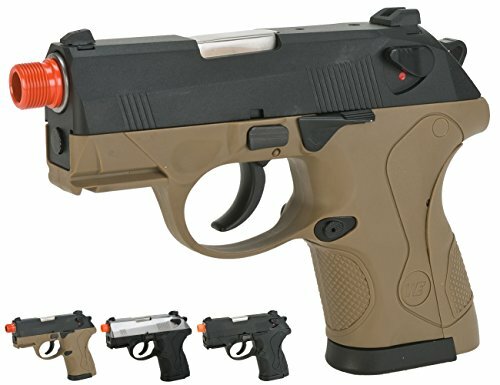 Spring action pistols make great backup airsoft guns. You’re not going to pull off sniper shots with a springer, but you can cover an entrance until it’s safe to ready your primary again. Most spring airsoft pistols are inexpensive, so you’re not going to break the bank. They make great gifts for newbies and veteran airsofters alike. They’re also a great option if you’re looking to get a young family member into airsoft without handing them an expensive piece of equipment to break. An arsenal of airsoft spring pistols opens up many options for some interesting games you can play with small groups of friends. What if you fall into a large puddle or creek? You won’t want to use your electric airsoft gun or your gas pistol until you’re sure you won’t do any damage to them. That springer in your pocket, though? It doesn’t have a battery or a gas cartridge. It should work fine if you get soaked on the field. If you’re the type of player that looks to pump pure performance out of your primary, you’re accustomed to dealing with engagement restrictions. A springer in your kit means you won’t have to safety kill or surrender every enemy you meet within ten feet. Most airsoft spring pistols don’t have high muzzle velocities. They usually clock in at 250 feet per second. That said, the FPS of a springer is one of its limitations. Since airsoft pistols don’t have hop-up units, the BB won’t be very accurate either. You’ll have a lot of trouble hitting a moving target. With a low FPS, your target may not feel or even hear the hit when you’ve shot them. You may need to hit them more than once. A spring pistol works best for holding a narrow passage or catching someone unawares. Another problem with spring action pistols is they tend to be made of poor quality materials. For some pistols, a collision with a wall could crack the frame. Still, there’s not a lot internally that could go wrong with the pistol. As long as you oil the pistol’s spring and tighten any screws once in awhile, your springer will last a long time. Even if it does break, replacing it won’t empty your wallet. Unfortunately, some of the airsoft spring pistols out there are sealed, so you won’t be able to open them. How do Airsoft Spring Action Pistols Work? Spring action pistols are simple devices. Basically, the system uses collected air and a spring to fire the BB on the trigger pull. When you load a magazine into your spring pistol, you’re not yet ready to fire. First, you need to add tension to the mainspring by pulling on the slide or hammer. This opens a chamber in the gun and allows air into it. A small notch in that chamber catches on another part connected to the trigger. When you pull the trigger, that part disengages from the chamber. The released tension pulls the whole chamber forward. The collected air contacts the BB, sending it out of the barrel. Then, the spring in the magazine pushes another BB into the barrel, ready for another shot. Because of the simplicity of the system, there isn’t much that can break inside the gun. When you’re in the market for a spring action pistol, the first thing you need to consider is exterior build quality. You don’t want your holdout breaking on you from a drop. Some of them may even crack if you bend them wrong during a squat. There are a few full metal options out there for you and even they won’t cost you more than $30. Since performance is pretty much the same across all spring action pistols, you don’t need to factor that into your decision. You do want to consider magazine size. After all, you don’t want to have to reload your last resort. Since it’s difficult to find extra magazines for individual models, you will usually have the one mag. And if that’s the case, you want it to be a deep mag. 15 or more BBs is a good amount to have. After that, there’s this factor to consider. Does it look nice? Is it the right size for your hands? Is it a replica of your favorite firearm? What about price? Will it be easy to replace if it breaks on you? Now with all that in mind, here are a few spring action pistols that we recommend! All of the airsoft pistols are tested with .12 gram BBs. If you load them with the standard .20g weight rounds, you’ll see a lower FPS, but a little more accuracy and range. If you are new to airsoft, it might surprise you to learn that, yes, AEPs are a thing! They blend the best parts of the AEG world with the compact size of a pistol. Gas powered pistols are great. But even the best gas-blowbacks suffer from temperature issues. In extreme cold and heat, the pistol may not work as well or at all. Not to mention the cooldown that happens when you rapid fire the pistol. An AEP will work in those extreme conditions just like your rifle will. You won’t get the realism of blowback action from any AEP. The electric motors don’t have it in them to both move the frame and fire the BB. Because most AEPs fire in both full- and semi-auto, they make great sidearms for snipers. 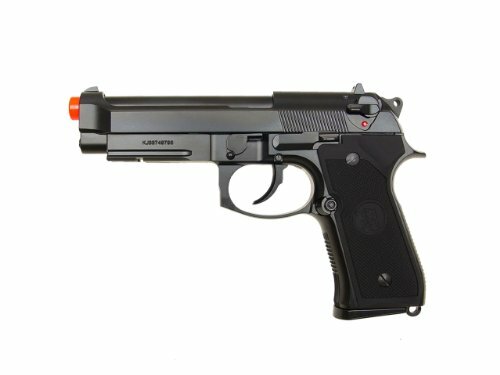 There are a few electric airsoft pistols available in Asian airsoft markets. Tokyo Marui makes electric Glocks, as well as the upgrades necessary to make them even better. Unfortunately, these pistols aren’t available in the States because of copyright issues. See our article on why it’s so hard to find airsoft Glocks here. In general, performance for most AEPs is going to be lackluster out of the box. In fact, there are few true quality pistols. And even fewer are actually pistols. One of the best things about AEPs is actually something that makes them difficult to work with. Because of their compact size, there really isn’t much going on under the hood. It’s rare to find an electric pistol that fires hotter than 300 feet per second. Upgrading is an option. And the upgrades you choose will be like those you’d make to improve the FPS of an AEG. Keep in mind that the instant you crack open your electric pistol, you’ve voided any warranty. Upgrade the spring to get more power. Upgrade the gears to get a cleaner action. Getting a higher rate of fire will be more complicated, however. You’ll need to put a more powerful battery inside. To do that, you’ll need to prepare the entire system to handle the extra electrical load. Stronger gears are essential since the extra oomph you’ll get from a larger battery would wear out stock parts. Pardon the jargon, but you could change the wiring of the battery from Tamiya to Deans. In short, Deans-wired systems offer less electrical resistance, which means less damage to the electronics. To make this happen, you’ll need some skills with a soldering gun. There are plenty of guides online explaining this process. Now, you’ll need a place to put that larger battery. In some cases, the best you can do is tape it to the exterior of the gun. It sounds like a ramshackle solution, but that’s because it is. If you’re skilled with fabrication of any sort, you could make an exterior compartment. The most important question you need to answer is about durability. 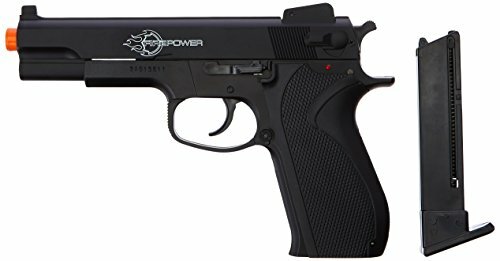 Is my new airsoft pistol going to last? That isn’t an easy question to answer. Some manufacturers have reputations for creating solid equipment. Some are known for making cheap knock-offs. Still, along any assembly line, you’ll find items that fall through the cracks of quality control. We call them “lemons.” Even if you’ve chosen a brand you know to be of high quality, your pistol can (and probably will) break down. This brings us to another of our considerations. Can you fix it? You’ll want a piece that has easy to find replaceable parts. What about performance? Out of the box, you’ll want something with built-in accuracy and power. But remember: muzzle velocity does not equal accuracy. You’ll definitely want something with a hop-up unit. Any pistol without one is going to be less accurate. You won’t be able to adjust the accuracy, either. What if you want to make what you’ve purchased better? You’ll want to pick a pistol with aftermarket support. If you choose the right model, you’ll have a wide choice of cosmetic upgrades. More importantly, you can upgrade things under the hood. This can be a complicated process. Remember that you can extend the barrels of most airsoft pistols to get a minor boost in accuracy and FPS. You should also consider the price. In airsoft, as with many things, you get what you pay for. While you should always look for the best deal, it may not be wise to buy anything that retails less than $100. At the same time, don’t assume the pistol priced closer to $200 is going to be the best choice. Again, look for manufacturers that you know to make quality gear. After that, there are a few miscellaneous considerations. If you’re a lefty, you’ll need ambidextrous controls. Do you want your pistol to be big, heavy and full metal? There are options for that. If you own a specific firearm, you may want to buy its airsoft counterpart. Is there a country, police force or action hero you want to mimic? Are you obsessed with a specific model? Consider giving more weight to those choices. The We-Tech Bulldog is definitely a good piece if you want to go for a super spy look. Many airsofters will tell you to stay away from We-Tech guns. But that’s because their older entries into the airsoft market gave them a bad reputation. The manufacturer has stepped up their game with the Bulldog. It mimics the PX4 Storm in design, so if you’re a fan of Berettas, this one’s for you. It has a strong build quality with its polymer lower frame and aluminum slide. The metal on polymer gives it a hard kick for airsoft pistols. The Bulldog Compact runs on green gas. Unlike many pistols, it comes in three colors: matte black, chrome and dark earth.The low FPS of the We-Tech Bulldog Compact means you’ll be less effective at range. Again, pistols aren’t meant to outrange anything. They are built for CQB, and the compact design of the Bulldog excels there. If you’re left-handed, you know life is already a struggle. Things just aren’t built for you. And you get ink on the back of your hand when you write with pens. Driving stick is that much harder to learn, too. Thankfully, KWA thought of you when they made the airsoft version of the Heckler and Koch USP 45. The biggest attraction to this pistol is its ambidextrous features. You’ll find the slide catch and magazine release on both sides of the pistol. Even if you’re not a lefty, you can still choose to fire left handed with this pistol. Even if it weren’t ambidextrous, the green gas KWA HK45 is a strong sidearm for your airsoft needs. Like its real-world counterpart, it has a metal slide and polymer frame. It also has a decocking mechanism for added safety. With its lower frame, you’re ready to attach lights and lasers. Pricing closer to $200, the KWA HK45 is pretty expensive for a pistol. Still, it’s well worth the price if you’re tired of dealing with airsoft guns that aren’t made for you. This ASG green gas powered pistol is a strong choice if you’re looking for something ready to accept a pistol suppressor. The reason you want a suppressor for your gun is so you can extend the inner barrel without the headache of replacing the outer barrel. The pistol will also complete your Russian loadout. Putting it next to other pistols, you’ll notice it’s lengthy. This helps to make the pistol more accurate than others on the market. The ambidextrous slide safety helps if you’re left handed. The pistol is faithful to its firearm counterpart. The grip is also thin, making it a unique feel in the hand. The two-tone look of the pistol makes it stand out. Its three-dot iron sights make acquiring and holding a target easier. This pistol fires a little hot. Some may see this as a drawback, especially at indoor fields. You can lower the FPS by using heavier weight BBs. This also helps your BBs maintain accuracy over longer distances. If you’re a fan of the Beretta M9, you’ll want to consider this pistol from Kuan Ju Works. KJW is a Taiwanese company that only makes gas blowback guns. Because of this, you can expect strong competitors from them in the airsoft pistol world. Probably the best feature of this gun is it can take both CO2 and green gas. You just need to buy the right magazine. The internals will still be under more stress from the higher-pressure CO2. Still, it is manufactured to deal with that stress. And KJW is one of the brands that has aftermarket support. The low gas efficiency comes from the KJW M9’s heavyweight slide. As far as realism goes, you can’t get much better than this. Without the magazine in it, the heft of the gun is close to that of the real thing. It functions like the firearm, it looks like the firearm and even takes down like the firearm. 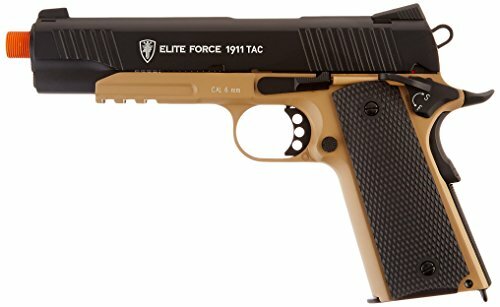 If you love the true American Classic that is the M1911 but want a CO2 gun, look no farther than the Elite Force 1911 Tac. This one comes in two color options: an aggressive black slide and dark earth frame or gray with black grips. The 1911 Tac functions like the real thing with both its slide lock and grip safety. Because of this, it makes a good starter gun. It is heavily reviewed on many websites and they are almost all glowing. Owners talk about strong build quality, suppressor-ready outer barrel, and accuracy out of the box. The CO2 cartridge goes into the magazine. This makes changing gas more complicated in a pinch. You can avoid trapping yourself without a gun if you learn how many shots a new cartridge fires. While 14 rounds is still a good amount, the best pistols usually have more rounds ready. If you’d like, there are 27 round extended magazines available. And who doesn’t like the battle worn look? 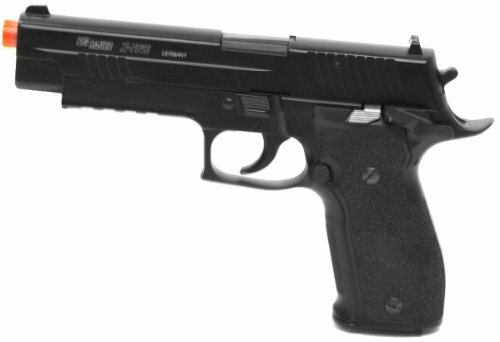 If you’re diehard fan of the Sig Sauer, you’ll love this P226 from Cybergun. Its trademarks are faithful to that of the firearm. You can expect strong performance and accuracy from this sidearm out of the box. It is also accurate out to 50 feet, which is impressive for a pistol of this size. Unlike some airsoft pistols, its safety snaps into place to let you know when it’s safe. The sights are high visibility compared to some of its counterparts. It also has a railed frame for adding lights and lasers. While the magazine’s gas is lacking, that’s because it has a 25 rounds capacity. And while I like trademarks as much as the next airsofter, I prefer my guns to perform. Looking good is a bonus feature. True airsoft Glocks are hard to find on the American market. So the next best thing is to find something that’s Glock-like. Enter the KWA ATP. Form and function combine with this pistol. Its curved back plate is adjustable, and the wolf-grey lower polymer frame gives it a unique tactical look. The gun runs on green gas and it has a respectable 23 rounds in its magazine. KWA designed the ATP with law-enforcement training in mind, so it has high standards. It has a railed polymer frame for accessories. The metal slide means you get both rigorous strength and a tough kick. This is a respectable choice for a sidearm, and your best bet for something like the common duty pistol. One of its biggest assets is its aftermarket support. Upgrades will be easy to find and install. If you’re looking to turn heads on the field, then this is the one to go with. Get your inner Agent Smith on with this Desert Eagle .50 caliber from Magnum Research. Because of its huge full metal slide, this hand cannon delivers a heavy satisfying kick with its full blowback action. And get this: it can fire in full auto! While you won’t get to utilize this in most indoor fields, the selective fire feature makes it a great choice for a primary rather than a secondary or sidearm. It carries 20 rounds in its magazine, so you’re not going to get a lot of time on rock’n’roll. Still, it’s enough for a few suppressive bursts. And at 300 to 340 FPS, you’re well within the projectile velocity limits of indoor fields. The biggest drawback here is the price, but it’s worth every dollar to see the look on your enemy’s face when they’re caught in your iron sights. Yes, this one’s another 1911. 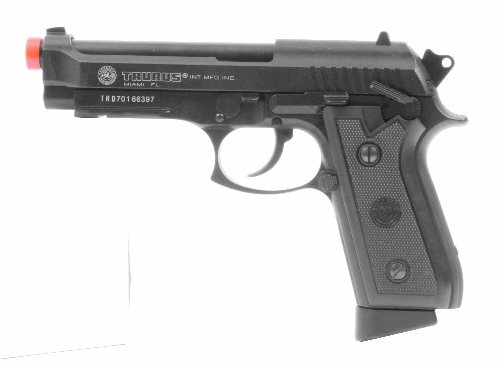 But that’s because this one is special because it is a clone of the Tokyo Marui line of Hi-CAPAs. That’s short for high capacity. Because of the popularity of TM’s Hi-CAPA line, many manufacturers have tried to replicate it. KJW does it best. Its classic tactical look comes with black and green frames. The Hi-CAPA has loads of aftermarket support. You can change almost everything in this pistol. You will find both cosmetic and internal parts for this 1911. And, with its low price-point compared to Tokyo Marui pistols, you’ll have more money to make those upgrades. As if strong aftermarket support wasn’t enough, the KJW Hi-CAPA takes both green gas and CO2 magazines. You have the choice between both gas systems. You’ll have to decide for yourself which is best for your kit and playstyle. It’s hard to find true problems with this gun. It’s that good. It is a little on the heavy side, but that contributes to this gun’s realism. In a perfect world, all of your airsoft equipment would work 100 percent of the time. But what do you do when your rifle fails on the field? Pull out your sidearm. What if that fails? Your only option is to call yourself out. Now your team is less one member, which is especially hampering in an objective mode. What you need is a holdout spring action pistol. It may not make you the most competitive player on the field, but it beats the walk of shame back to respawn. They also make great secondaries guns for new players. 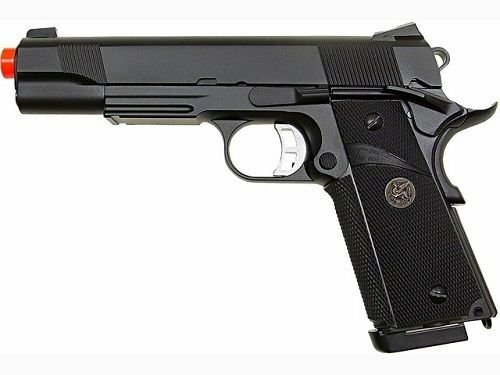 The UTG Sport M1911 comes ahead in this spring action all-call because of its durability and the value of what comes in the package. The two magazines, while not especially deep, have a handy speed load feature that isn’t available in gas blowback pistols four times its price. Most springers on the market only come with one magazine. The UTG Sport M1911 will not disappoint. 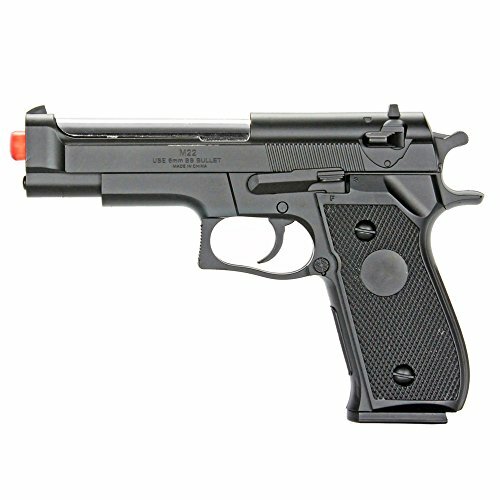 Any gas blowback pistol will outpace your airsoft spring action pistol. But that’s not why you buy a springer. Their value comes from their low price point and the simplicity of design. The spring action pistol shines when the rest of your equipment fails. Should the worst happen during a game, don’t walk back to spawn empty-handed. Pull out your airsoft spring action pistol and go down swinging. 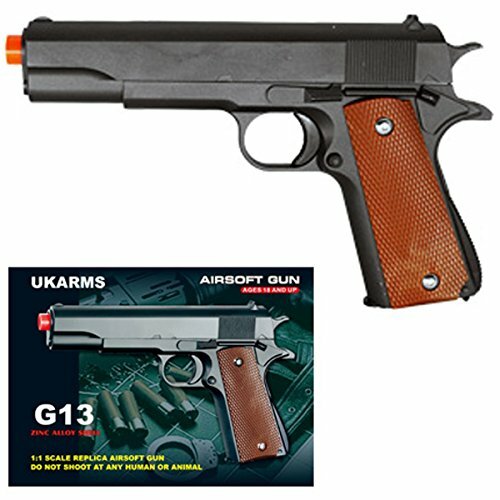 If you’re looking for an airsoft pistol that’s full metal, a good choice for you is the UK Arms Colt 1911. The only plastic parts on this piece are the mock-wood grip and the magazine. Expect this one to stand up to tough conditions on the field. Though the plastic grip plate may crack, it will only mar the cosmetic quality of the airsoft gun. It will not affect performance. And the iron sights, while very low to the frame, aren’t of much use anyway. You’re not going to be sniping with a spring action pistol, anyway. Nothing beats the feeling of the airsoft hand cannon in the hand. The SoftAir Desert Eagle .44 spring action pistol comes in all black and a shiny two-tone silver and black. The airsoft gun may be made of plastic, but it’s still durable. Fully loaded, it weighs one pound, which is a lot for spring action pistols. The Desert Eagle .44 is surprisingly accurate and has great range for a spring pistol. While the price of this gun is a little high, the value is there. 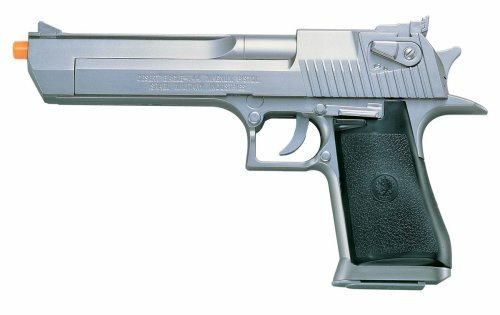 You could buy a low-end non-blowback gas pistol with the money you spend on the SoftAir Desert Eagle. That gas pistol would likely fall apart after the first few mags. And while it’s too big for a pocket, why would you want to hide it? The SoftAir Desert Eagle is something you’ll want your enemies to see on the battlefield. A springer firing higher than 250 FPS is a rare find. The Firepower .45 fires at 328 FPS. While it will still be hard to hit a moving target because of your rate of fire, means your target will feel the hit. As advertised, the slide is metal and the frame is a good quality plastic. The Firepower .45 doesn’t exactly have a real-world counterpart, which is why there are no impressive trademarks on it. And while the magazine is a little small, you won’t empty it when it counts. 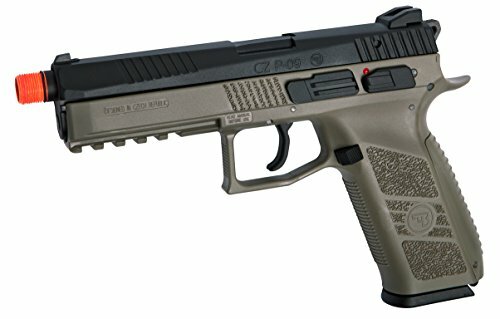 The BBTac BT M-22 is a strong choice if you’re looking to save a little more money on your spring pistol. It’s also great to stock up for special game modes to play with friends on a small scale. It looks a little like a Beretta M9 and is about the same size. It will easily fit in a pocket ready for the last stand. While this gun is made almost completely out of plastic, it doesn’t have to be a problem. It will last you a long time if you treat it right. 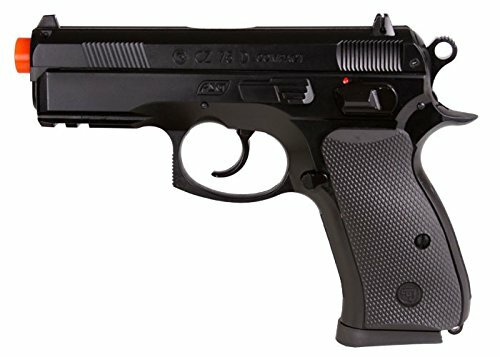 The ASG CZ 75D is a great platform in a small package. It has a durable metal trigger that you won’t have to worry about breaking with regular use. Most of the gun is plastic, though. It has an accessory rail on the frame. It would be best to use a flashlight if you put anything up front. Loading the magazine is pretty fast, though there’s only 13 round in it. It can be disassembled to perform maintenance. The safety is especially exciting since it gives a nice loud snap to confirm you’re on safe. It’s rather accurate as well, out to 70 feet. I love the feel of compact pistols in the hand. While this pistol is made of plastic, it isn’s the usual ABS plastic. It’s the more rugged plastic polymer. The low FPS may be a problem, but your target should feel a hit if you hit them in close range. This is where any spring action pistol does best. This UTG Sport pistol is one of the best available. The only plastic parts on this piece are the grip covers and the outer barrel. The rest of it is made of a strong metal that won’t crack under duress. Even the magazines are metal! While its magazines have a low capacity at 13 rounds, there’s room for 90 BBs in a special compartment in the mag. To reload using this feature, turn the magazine upside down and pull down the spring. Then, shake the magazine until the channel fills. Like a real M1911, the UTG Sport has two safeties. One is on the grip, and the other is a slide stop style. You’ll find the pull of the trigger actuates the hammer as well. This is a feature not included with most spring action pistols. It also breaks down like a real 1911, so maintenance is easy. You’re in tight against a doorway, readying to pie the corner into a room. What do you want in your hands? That lengthy airsoft M4 is good at covering a long hallway, but now, with it pressing against your shoulder, barrel pointing at the door jamb, it’s looking a little too lengthy. You’re going to expose more of yourself to the enemy when you peek in. What you want in your hands is a trusty sidearm with the reliability of carbon dioxide gas behind it. With the best CO2 pistol, you’ll be ready to breach and clear your way to victory. After the dust settles over this CO2 pistol All-Call, the P226 X-Five pulls ahead because of its faithfulness to the real firearm and its magazine capacity. With its deep mag, you’ll need fewer reloads than your competitors. You don’t have to worry about it being restricted in an indoor field because of its low FPS. Remember, though, that FPS does not equal accuracy. Spend some time with your P226 X-Five in the yard and see this for yourself. This CO2 pistol only needs as much care and maintenance as any other pistol out there. Don’t forget to apply silicon oil to the seal where the 12g cartridge meets the gun each time you change it out. Do that, and you’ll have a reliable sidearm that will help you dominate in CQB situations. So, sling that M4 to the side and ready yourself to pie the corner like a pro with your P226 X-Five. Nothing beats the feel of a true American classic in the hand than the M1911. 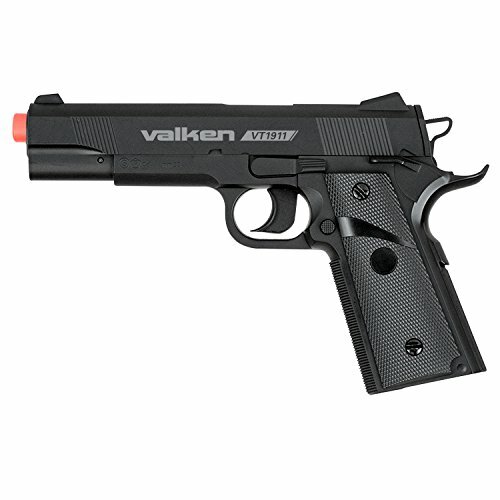 This Valken Tactical 1911 is a great choice if you’re just getting started in airsoft. It’s also for the player looking to test the waters of the CO2 pistol world without diving right in. Though it does not have blowback action, you get everything else there is to love about a CO2 sidearm. The 12g cartridge fits in the grip, so you only have to change out one of them when you’re empty. Extra magazines are readily available. While the Valken Tactical 1911 Chronos a little high, you can bring that FPS down with heavier BBs. As a bonus, those heavier BBs will compensate for the accuracy problems because of the pistol’s lack of a hop-up. If you like the full-auto feature of the Desert Eagle but don’t like its price point, SoftAir has another option for you. 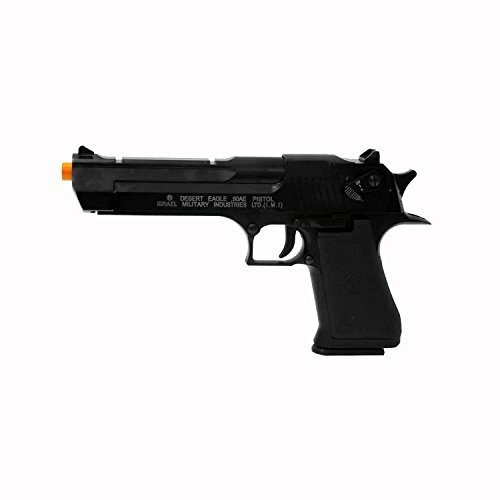 With its more reasonable size, the Taurus PT99 is a great secondary for all of you airsoft snipers out there. You’ll be better able to defend yourself with its full auto feature if someone sneaks in close while you’re picking off their teammates. In the box, you’ll find an extra cartridge end cap, an essential part to keep the CO2 in the magazine. This one clocks in between 290 to 330 FPS, so you’re totally fine running the PT99 indoors. Other reviews you may see may tell you it jams or doesn’t work. As long as you perform maintenance even before your first test fire, you can expect your PT99 to carry you through sticky CQB situations. The biggest problem you’re going to have with any airsoft revolver is that they usually shoot at 400+ FPS, even with .20g BBs. You’re definitely going to have some difficulty trying to get this one cleared for indoor play, where CO2 pistols really start to show their value. 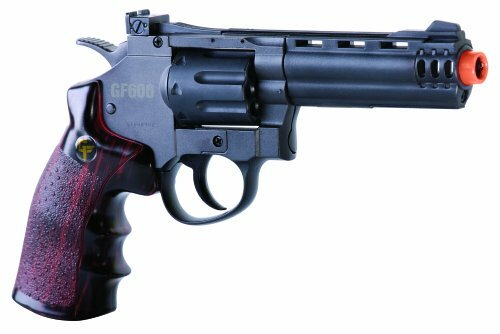 However, if you find yourself outdoors in a close quarters situation, or you’re just really itching to ask your enemies if they feel lucky, the Crossman GF600 is a good choice for you. One of the biggest advantages it has over other airsoft revolvers is it loads eight shots into its speedloaders. It’s also a double action revolver, so you won’t have to pull back the hammer each time you want to shoot. So you want an airsoft sidearm, but you don’t want to deal with the quirks of a gas powered system. You have more experience with airsoft electric rifles and you’d like that knowledge to transfer to your pistol. Maybe you just want something a little different. If you’ve had any of these thoughts, an airsoft electric pistol should be on your shortlist. As always, sorting through the chaff to find the wheat can be difficult. Fortunately, IAmAirsoft is on your side. While the market for airsoft electric pistols is rather limited, the choices in our list present what the best AEPs have to offer. They provide reliable electric performance in a compact package. The ASG Scorpion wins out because of its versatility, build quality and commitment to realism. However, the GameFace AP13 is still a strong choice. For this list, it’s more of a tie. The GFAP13 wins out in the true pistol market and the ASG Vz. 61 takes the top machine pistol spot. Either pistol is a solid choice if you’re looking for your next sidearm. The GameFace AP13 is your best choice if you want something that will fit in your pistol holster. It even looks remotely Glock-like. It fires in both full- and semi-automatic. And with a deep 30 round magazine, you’ll actually be able to keep up that fire. It has a hefty weight to it and has a metal gearbox like most AEGs. The gun comes with a charger. You’ll need to remove the slide to insert the included battery. It’s an easy process, and the gun comes with a manual to help you get it ready for the field. 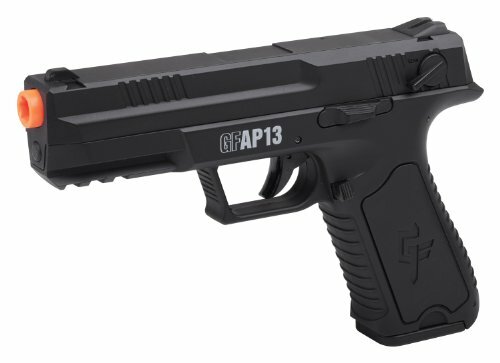 While the GFAP13’s FPS will mean you’ll have to lead your shots when firing at moving targets. At least you can fire in full auto, though. Because of this, you’ll more likely hit the enemy. Low 250 FPS out of the box. Look, in that holster! Is it an airsoft SMG? Is it a pistol? No, it’s a machine pistol! From Action Sports Games comes the fully licensed Cesk Zbrojovka Scorpion Vz. 61. You can see the commitment to realism by looking at this airsoft machine pistol. Trademarks adorn the frame. It even has the narrow pipe-like muzzle like the real deal. With the collapsible wire stock, you can choose to shoulder fire or shoot one handed. ASG kept polymer plastic parts to a minimum. Those parts are the upper frame and the textured grip. The rest of the exterior is metal. With 38 rounds in its high capacity style magazine, you’ll have enough ammo to protect yourself as well as provide suppressive fire in a pinch. It fires in both full- and semi-automatic. Again, the FPS is low, but that’s what you get when you enter the AEP market. The rest of the features of the Vz. 61 make it the clear choice to fill your electric machine pistol needs. Hopefully, this list was helpful to you. We’ve outlined several strong choices for airsoft pistols making your decision easier. When you can better measure your enemy’s distance in feet than yards, there is nothing better to have in your hands than a pistol. Corner peek-and-shoot duels will be easier when your gun is light and small. Your enemy will beat you with range if they have their rifle. But you will have unrivaled mobility with your new airsoft pistol. You can upgrade most of the pistols on this list in some way. Only the KJW 1911 has access to the popular Hi-CAPA line. Nothing beats the ability to make a gun unrecognizable from its stock form. You can truly make this one your own. It is the best way to enter the Hi-CAPA world in the American market. It will not disappoint. The only thing left to do is train. Practice loading drawing and loading your sidearm so readying it is that much faster. Dial in your hop-up to line up those long-distance shot. With an airsoft pistol in your holster, you’ll be ready to dominate in the close encounters that happen all too often in airsoft.